Our QES1500-300 Series Panel Mount LCD TFT Displays are designed to comply with the most rugged industrial factory floor environments and can withstand the higher temperatures, vibration, dirt, and dust that are commonly found therein. 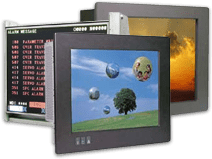 The QES1500-300 Panel mount flat-screen monitors feature industrial grade TFT LCD panels with improved brightness, contrast and overall image quality superior to that of many commercial-grade LCD monitors. Each QES1500-300 Series Panel Mount LCD Monitor features a fully-sealed, IP65/NEMA4 316 front bezel, delivering superior protection against windblown dust and rain, splashing or hose-directed water. We also offer corrosion-resistant Stainless Steel IP66/NEMA4X front bezels for even harsher environments. We also offer these NEMA 4/12 and 4X Panel Mount Displays in a variety of standard sizes and in custom configurations as well. With contrast ratios exceeding 300:1 and brightness levels of 450 cd/m2, the QES1500-300 Series Color panel-mount LCD display is a good choice for all of your industrial display needs. These displays are a great fit for factory automation, pharmaceutical operator interface, process control, and other harsh computing environments. Best of all, our proprietary design offers compatibility with older slow-scan video formats i.e. MDA, CGA, EGA and RS170/RS343 analog signals below 30 kHz. We can support differential ECL or TTL applications as well, so if you need to replace an older, legacy monitor, one of our rugged, high performance QES1500-300 Series Panel Mount LCD displays may be just the monitor you’re looking for. We offer a wide range of displays for many industries. View all our products if you can’t seem to find what you’re looking for.